Perfectly Imperfecta is the powerful story about a boy name Conner, living an unimaginable journey. 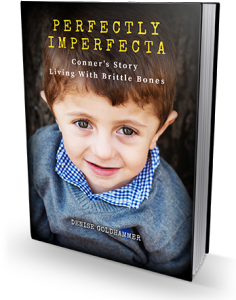 Conner was born with a rare life-altering illness called Osteogenesis Imperfecta, more commonly known as Brittle Bone Disease. This story will take you through the lives of his family and what it is like living with Osteogenesis Imperfecta. Conner is one of five children, he is also a twin! Conner’s twin sister does not have OI. Conner’s condition is caused by a genetic mutation that only effected him. Doctors suspected Conner had OI in utero, as his limbs were much shorter than they should be and he was showing fractures and bowing of his bones. Conner has a severe type of OI which is type III. He has had over 130+ broken bones in his short five years of life. Conner’s bones were compared to paper when he was born and his parents had to carry him around on a pillow because he was so fragile. He has gone through multiple surgeries to have rods/wires placed in his bones to help straighten them and act as an internal splint. Conner can expect hundreds of fractures in his lifetime, but his spirit remains unbreakable.